Magic guild in the town of Wisdom, this was one of the training places of the legendary Defilers. The building is broken into 3 studies (tri-arcanum). The Internalists, led by Charolyn Karath, are the Psionicists. The Granted are those that have been granted magic by another source, such as Warlocks and Priests. They are lead by Wesvon Mardeen. Lastly, the most organized and powerful are the Weavers, the Wizards and Diabolists. Leading them was the wizard Kel-ed until his Death, and now it is Xerx’ses. While Xerx’ses travels with CrIsis, it is lead by Xerx’ses second, Mustrum. CrIsis visits here in Selestra, 111. See the log Shouldering the Sins of the Past. Kel-ed dies during the Battle of Avramstown. See the log Triumphant. Xerx’ses and Indaris are proud members of the Guild. CrIsis has interacted with the Roll Master, Rules Master, and the Arena Master. This is the Tri-Arcanum Guild from the sky looking down upon the roof, 20 floors in the sky. 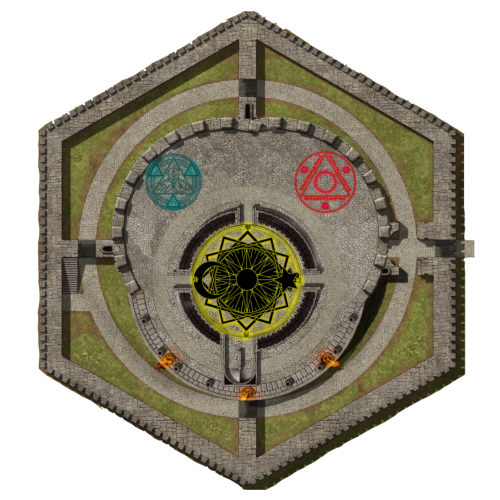 Symbol and tower map from our own AZ Rune.